As I’m out driving or cycling around, I enjoy watching the changing landscape. A significant change this summer has been the demolition of the old middle school to make way for the new Dansville High School. 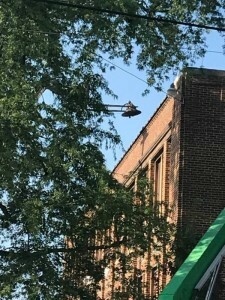 In recognition of its significance to the community, special elements of the demolished building have been preserved for installation in the new one, including the school bell. Just as the Dansville community recognized the need to remove an old school and build a new one, most of us experience moments when we find the need to move forward, yet want to hold on to mementos from the past. This may be the case when inheriting belongings from an older relative, or downsizing to a smaller living space. It can be overwhelming to decide which photos and documents to keep, and also to figure out how preserve them against the elements of dust, light and moisture. Capital Area District Libraries offers resources to assist with preserving family mementos. For example, the Digital History Station, housed in the Downtown Lansing branch, provides options for converting many types of media to digital format, including cassette and VHS tapes, slides, negatives and floppy disks. Photos and documents can be scanned to digital format as well. You may be surprised to learn that even handwritten documents can be scanned and “translated” into type, which can transform a formerly illegible letter or recipe into a treasured family keepsake. Knowledgeable local history library staff are available to assist with preservation projects. For questions or to make an appointment to use our equipment, call 517-367-6313 or email localhistory@cadl.org. Capital Area District Libraries’ Dansville branch is located at 1379 E. Mason Street in Dansville. For more information, call 517-628-3743 or visit cadl.org.